Purr Data a.k.a. 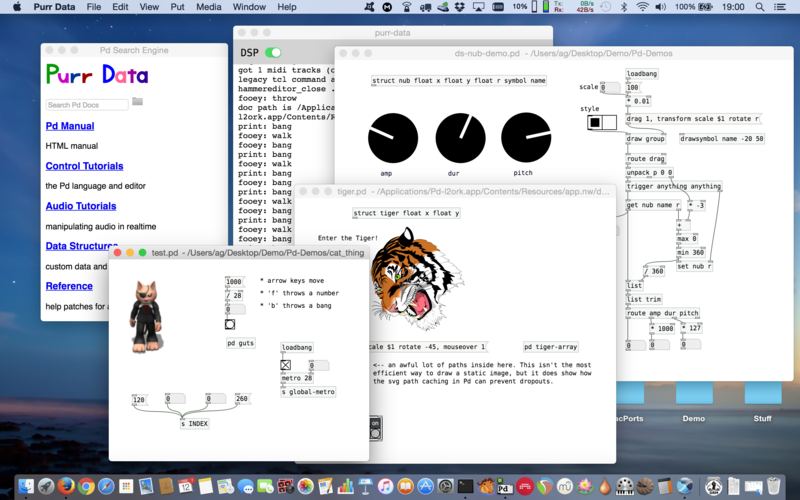 Pd-l2ork 2 is an improved version of Miller Puckette’s interactive computer music and multimedia software Pd. This document provides new or prospective Purr Data users with a gentle introduction to the program and some helpful information to get started. Purr Data is the latest (2.x) branch of Ivica Ico Bukvic’s Pd-l2ork. Pd-l2ork in turn is a fork of Hans-Christoph Steiner’s Pd-extended, which has been the longest-running (and arguably the most popular) variant of Miller Puckette’s Pd. Pd a.k.a. Pure Data, the common basis of all these variants, is Miller Puckette’s interactive and graphical computer music and multimedia environment. Pd is also the premier open-source alternative to Cycling74’s well-known commercial Max program (whose original version was also developed by Miller Puckette when he was at IRCAM in the 1980s). There are a few other popular and very capable applications in the realm of computer music and media art, most notably Csound and SuperCollider. But Max and Pd’s special appeal is that you work in an intuitive graphical “patching” environment which allows you to put together advanced real-time signal processing applications without having to learn a “real” programming language. Puckette’s version of the program is sometimes jokingly referred to as “vanilla” Pd, because it comes without any extras and thus provides the purest taste of Pd, you might say. In keeping with this metaphor, the other Pd variants are often called flavors. While vanilla Pd, being the reference implementation, remains critically important for the development of Pd’s real-time engine, its Tcl/Tk-based graphical user interface has never been very pretty or convenient. Consequently there have been several attempts by the community to improve Pd’s user interface in various ways. Pd-extended is the earliest and the longest-running of these, which also includes a fairly complete selection of 3rd party add-ons. However, its development has stopped in 2013 due to lack of contributions, and thus it receives no more bugfixes and updates of the real-time engine. Ico Bukvic introduced Pd-l2ork in 2010 as a fork of Pd-extended to be used by the “Linux Laptop Orchestra” (L2Ork) he founded at the School of Performing Arts at Virginia Tech. Although the original motivation was to create an improved version of Pd-extended to be used by the L2Ork (hence the name) as well as in education, on Linux it quickly became a more up-to-date alternative to Pd-extended offering a fair number of additional bug fixes and GUI improvements. This is mainly due to its more nimble development model which allows bugfixes and improvements to be deployed quickly even if this may have an impact on backwards compatibility. Vanilla Pd, on the other hand, necessarily has a much firmer outlook on backwards compatibility, so that it is still able to run very old patches created with ancient Pd versions. 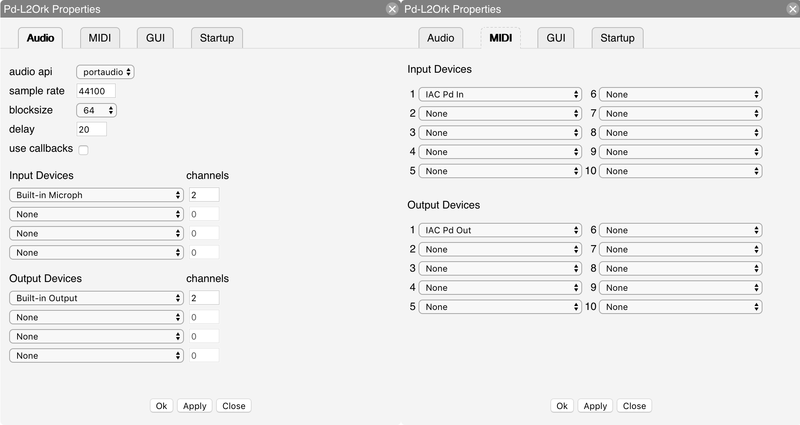 Despite the many and substantial improvements it offers, Pd-l2ork’s GUI is still based on Tcl/Tk. This is both good and bad. The major advantage is compatibility with vanilla Pd. On the other hand, Tcl/Tk looks and feels outdated in this day and age, even when going to some lengths with theming, as Pd-l2ork does. Tcl is a rather basic programming language, and its libraries have been falling behind, making it hard to integrate the latest advancements in GUI, multimedia and web technologies. Also, Pd-l2ork’s adoption was hampered by the fact that it was essentially tied to Linux, and thus a cross-platform solution was needed. Figure 1: Purr Data running on macOS. Purr Data’s nw.js GUI also has some disadvantages. First, some of the included externals still rely on Tcl code, so their GUI features will not work in Purr Data until they get ported to the new GUI. Second, the size of the binary package is considerably larger than with Pd-l2ork or Pd-extended since it also includes the full nw.js binary distribution. (This is a valid concern with many of the so-called “portable desktop applications” being offered these days, but in the case of Purr Data it is mitigated by the fact that its Pd-l2ork base is not exactly a slim package either.) Third, the browser engine has a much higher memory footprint than Tcl/Tk which might be an issue on embedded platforms with very tight memory constraints. While none of these issues should normally be a real show-stopper on the supported platforms, it is worth keeping them in mind. Finally, Purr Data is still comparatively young, but its basis is the tried and proven Pd-l2ork, the present release has been thoroughly tested and many bugs have been ironed out, so it is certainly ready for day-to-day use. It also offers some really compelling advancements over its predecessors. If you have been looking for a modern and actively-maintained successor of Pd-extended, this is it. I’ve nicknamed it “Purr Data”, because cats. Quite obviously the name is a play on “Pure Data” on which “Purr Data” is ultimately based. It also raises positive connotations of soothing purring sounds, and makes for a nice logo. We also refer to Bukvic’s original Pd-l2ork version as Pd-l2ork 1.0 or “classic” Pd-l2ork. Note that Purr Data still clearly shows its Pd-l2ork heritage. It shares a lot of code with Pd-l2ork (essentially all the non-GUI parts), and the executable, library directory etc. are all still named pd-l2ork as well. At JGU we also maintain a collection of Linux packages for Arch Linux (via the Arch User Repositories a.k.a. AUR) and recent Ubuntu releases (via Launchpad). More information and installation instructions can be found at https://l2orkaur.bitbucket.io/ (Arch) and https://l2orkubuntu.bitbucket.io/ (Ubuntu). Besides Purr Data, these repositories also contain the “classic” Pd-l2ork (at least on older Ubuntu systems where Pd-l2ork 1 still runs), as well as two additional programming extensions for Pd which enable you to run Faust and Pure externals in Pd-l2ork and Purr Data. The JGU packages also offer the advantage that they let you install both classic Pd-l2ork and Purr Data on the same system. Of course, it is also possible to build Purr Data from source. With the latest additions to the build system, this task has become a lot less daunting than it used to be, and the Purr Data website has some instructions. However, because of the large number of included externals, the build process is rather involved, requires a lot of 3rd party dependencies, and takes quite a while even on modern high-end hardware. Therefore, unless your system isn’t officially supported or you have specific requirements forcing you to compile from source, we recommend using the available binaries. You can also right-click on a patch (.pd) file, choose “Open With” and then select Pd-l2ork or Purr Data to open the patch in Purr Data. This may require a first-time setup to associate the .pd file type with the Purr Data program, however. Most desktop environments will also let you set Purr Data as the default application for .pd files, so that you can subsequently open patch files simply with a double-click. The details of this are system-specific; usually right-clicking the file and choosing Properties or some similar option (Get Info on macOS) will give you a dialog which allows you to change the file association. In any case, Purr Data should then launch its main “console” window which logs all messages from the program. If you opened a patch file, it will be shown in a separate “canvas” window. Purr Data understands basically the same set of command line options as vanilla Pd or Pd-l2ork. On Linux, you can find out about these by running pd-l2ork -help (purr-data -help when using the JGU packages) from the command line. (This isn’t easy to do on Mac and Windows, since the program executable is stowed away somewhere in the application folder.) Some common options which can be placed into the startup flags are -path and -lib, see section GUI and Startup Options below. Unlike vanilla Pd, Purr Data normally runs as a single application instance. If you load additional patch files (by invoking the pd-l2ork executable or by clicking patch files in the file manager), they will be opened as new canvas windows in that single unique instance. This prevents the kind of confusion which often arises with vanilla Pd if you accidentally open different patches in different instances of the application. Pd requires that patches are loaded in the same program instance if they are to communicate via Pd’s built-in messaging system (send/receive), or if you’d like to copy/paste subpatches between them using the internal clipboard. In its default configuration, Purr Data makes sure that this is always the case. For most applications this shouldn’t be needed, and the single application instance will be most convenient. But there are some situations in which you will want to run several instances of Purr Data instead. Because Purr Data’s real-time processing is all done in a single process associated with the application instance, a single application instance cannot take advantage of the multi-processing capabilities on modern multi-core systems. Some common use cases for multi-processing are if your Pd application involves both audio and graphics processing (typically using the Gem library), or if you have several independent audio processes which you’d like to be run in parallel. In such cases you will want to use the -unique option to launch two or more instances of Purr Data, each with their own sets of Pd patches which will then run on different instances of the real-time engine. When you launch Purr Data for the first time, most likely you will have to configure some things, such as the audio and MIDI devices that you want to use. Like Pd-l2ork, Purr Data provides a central “Preferences” dialog which lets you do this in a convenient way. The screenshot in fig. 2 shows how the “Audio” and “MIDI” tabs in this dialog look like on the Mac. For most purposes it should be sufficient to just select the audio and MIDI inputs and outputs that you want to use from the corresponding dropdown lists. Pressing the Apply button applies the settings without closing the dialog or saving the options permanently. If you want to make your changes permanent, you must use the Ok button instead. This also closes the dialog. You can redo this procedure at any time if needed. Note that it is usually possible to select multiple input and output devices, but this depends on the platform and the selected audio/MIDI back-end or “API”. Also note that on Linux (using the ALSA API), the MIDI tab will only allow you to set the number of ALSA MIDI input/output ports to be created; you then still have to use a MIDI patchbay program such as qjackctl to connect these ports to the hardware devices as needed. Figure 2: Audio and MIDI setup. One pitfall of the Pd engine is that it does not rescan the devices if you connect new external audio or MIDI gear while Purr Data is already running. Thus you need to relaunch the program to make the new devices show up in the preferences. In the case of MIDI, it is easy to work around this limitation by employing virtual MIDI devices, which ALSA MIDI does by default. On the Mac you’d use the IAC devices, on Windows a MIDI loopback driver such as loopMIDI for that purpose. You then wire these up to the MIDI hardware using a separate patchbay program. A similar approach is possible with audio loopback software such as Jack. The GUI theme can be selected on the “GUI” tab (see fig. 3, left). The changes will be applied immediately. Purr Data provides various different GUI themes out of the box. Note that the GUI themes are in fact just CSS files in Purr Data’s library directory, so if you’re familiar with HTML5 and CSS then you can easily change them or create your own. Another useful option on the GUI tab is “save/load zoom level with patch”. Purr Data can zoom any patch window to 16 different levels, and this option, when enabled, allows you to store the current zoom level when a patch is saved, and then later restore the zoom level when the patch gets reloaded. The remaining options on the GUI tab are related to the help browser, we’ll discuss these in section Configuring The Help Browser below. Figure 3: GUI and Startup options. The final tab in the preferences dialog is the “Startup” tab (fig. 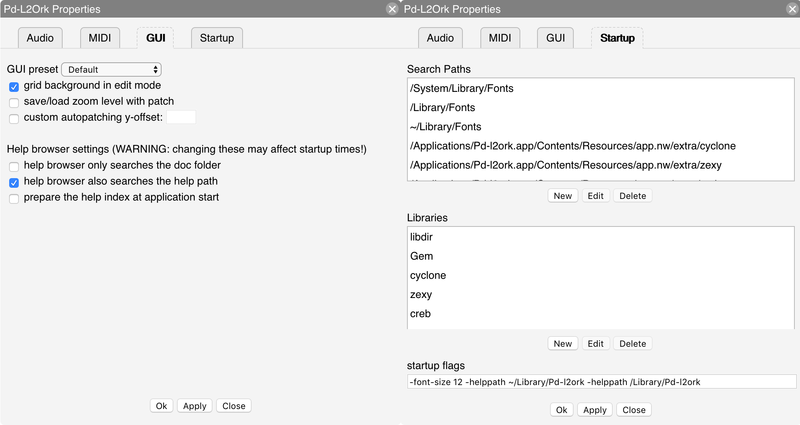 3, right), which lets you edit the lists of library paths and startup libraries, as well as the additional options the program is to be invoked with. By default, Purr Data loads most bundled external libraries at startup and adds the corresponding directories to its library search path. If you don’t need all of these, you can remove individual search paths and/or libraries using the “Search Paths” and “Libraries” lists on the Startup tab. Just click on a search path or library and click the Delete button. It is also possible to select an item and add your own search paths and external libraries with the New button, or change an existing entry with the Edit button. Any desired startup options can be set that way, i.e., anything that Pd usually accepts on the command line. However, note that the startup flags require that you relaunch Purr Data for the options to take effect (the same is true if you change the list of startup libraries). Also, while setting paths and libraries via the startup flags is often convenient, there are some downsides to having these options in two different places, see “Sticky” preferences in the Tips and Tricks section below. As with the other configuration options, remember to press the Ok button in order to have your changes recorded in permanent storage. This will also close the dialog. Finally, note that if your configuration gets seriously messed up, there are ways to reset Purr Data to its default configuration, see Resetting the preferences in the Tips and Tricks section. The best way for new users to learn how to use Purr Data, and Pd in general, is its excellent integrated help system. This is really one of the hallmark features of the Pd program, no matter which flavor you use. Purr Data’s help system offers hundreds of help patches covering many different areas, and these help patches are not just documentation, they are real Pd patches which you can run to try them out, and then copy and paste relevant parts to your own patches. It is worth noting here that Purr Data, like Pd-l2ork, continues to build on the Pd-extended documentation efforts. This includes over 200 new and updated help files, including the cyclone library documentation. All of the new help files provide supporting meta info contained within the META subpatch (which is needed, in particular, to enable keyword searches), following the standards set by the Pd documentation project (PDDP). This is an ongoing effort, however, and so not all help patches have been converted yet. While the sheer amount of help patches can be overwhelming at first, there are some sections in the documentation which are organized as tutorials, so that you can work through them step by step. This includes all the help patches that go along with Miller Puckette’s comprehensive book “Theory and Techniques of Electronic Music”, which are still the best way to get to grips with Pd. If you are new to Pd, we recommend that you work at least through the sections “Control Tutorials” and “Audio Tutorials”, and really try to understand what’s going on in these patches. With a complex software like Pd, it’s all too easy to fall victim to “cargo cult” habits if you just blindly copy parts of other people’s patches. You should resist that temptation, at least until you have a solid foundation under your belt, and those two sections will provide you with that. Purr Data’s central point of entry to the help system is its Help Browser, discussed below. In addition, as with other Pd flavors, it is also possible to open the help patch for an object by just right-clicking on that object in a patch and choosing the “Help” menu item. Using the Help / Help Browser menu option (shortcut: ctrl + B, or cmd + B on the Mac) fires up Purr Data’s help browser, which looks deceptively simple (see fig. 4) and is actually quite easy to use, but offers a lot of functionality under the hood. You can search for object names or keywords by typing them in the search entry field at the top of the browser, or you can browse the available documentation sections in the browser’s home screen, which is what gets shown initially below the search entry, by just clicking on one of the section titles. On the right in fig. 4 you can see how the display changes after you entered some search terms like “audio devices” and hit Enter. As indicated, you can enter multiple search terms and they will all be searched for in one go (which amounts to matching any of the given search terms, i.e., all patches will be shown for which at least one of the search terms matches). The found help patches will be shown in the list (with short descriptions of the patches if available). You can then click on one of the patches to open it in a canvas window. Clicking on the “x” symbol in the search entry returns you to the home screen. Note that to keep things simple and not to overwhelm novice users with too much information, the search function only covers the “official” documentation (the doc/ hierarchy) by default. There are ways to change the scope of the keyword search in the GUI preferences, see Configuring The Help Browser below. But in any case it is also possible to explore all the other help patches which are available in the extra/ hierarchy (which contains all the 3rd party abstractions and externals), by employing the little folder icon to the right of the search entry. This will open a file browser (initially on the doc/ folder) which can then be used to browse all the available help patches. When looking for help patches in the extra/ hierarchy, which is a sibling of doc/, simply navigate to that directory in the file browser and click on one of its subdirectories containing the various abstractions and externals. Double-clicking on a help patch will open the patch in its own window, and then also show the corresponding directory in the help browser, so that additional help patches from the same folder can be accessed without any further ado. If you already know the name of a subdirectory with interesting help patches, you can also just type its name in the search entry (including the doc/ or extra/ prefix) to have the corresponding folder displayed in the help browser. For instance, typing “extra/mrpeach” and Enter provides a quick way to access the help patches for the mrpeach externals. Note that in any case, you can always return to the home screen of the help browser by clicking that tiny “x” symbol in the search entry (or by just hitting Enter in the field if it is empty). The GUI tab in the preferences dialog (cf. GUI and Startup Options and fig. 3, left) offers some options to configure the scope of the keyword search. Note that in order to perform keyword searches, the help browser first needs to construct an index of all the help patches and their keywords. This is either done on the fly, when the help browser is first opened during a Purr Data session (this is the default), or when the application is launched (there’s a checkbox which lets you enable this). Once the browser has been launched, it will always come up quickly on subsequent invocations. But depending on how many patches you are indexing, creating the index on first launch may take a while (anywhere from less than a second to several seconds on modern hardware), so changing these options will have an impact on startup times. If Purr Data seems to launch slowly, being stuck in index generation, and you rarely use the help browser, then you want to make sure that the “prepare the help index at application start” option is unchecked (which is the default). On the other hand, if you’re using the help browser very frequently and it seems to come up very slowly on first launch, you may want to check that option so that index creation is already done after launching the program. If “help browser only searches the doc folder” is checked (which is the default), then keyword searches are confined to the doc/ hierarchy. This is the fastest option and will be sufficient for novice users at least, as it covers all the official documentation that ships with Purr Data. However, if you’re an expert user and frequently use 3rd party externals living in the extra/ hierarchy, then you may want to uncheck this option to have all the remaining subdirectories in the pd-l2ork library directory indexed as well (note that this may slow down indexing considerably). The “help browser also searches the help path” option, when checked, lets you tailor the keyword search to the externals you’re working with, so that you won’t be swamped with keyword matches from externals you never use. These externals may be located anywhere you choose, including the extra/ hierarchy, but note that if you’ve already unchecked the “help browser only searches the doc folder” option, then there’s no need to also explicitly add subdirectories of extra/. In either case, the directories to be searched with this option are set using Purr Data’s help path (having them in the library search path is not enough). You do this using Purr Data’s -helppath option which can be added to the “startup flags” field at the bottom of the Startup tab. E.g., on Linux you may want to add something like -helppath ~/pd-l2ork-externals (that directory is often used on Linux for custom and personal external collections). Caveat: Again, be warned that changing these options and then installing external collections with gazillions of patches into either the extra/ hierarchy or on your personal help path may have a very negative impact on startup times, since all these patches will have to be scanned during index creation. Future Purr Data versions will hopefully provide some form of persistence and incremental updates of the search index to mitigate these effects. But for the time being, judicial use of the above options should in most cases give you a sensible setup which does not slow down index creation too much while fulfilling your documentation needs. Also note that because the search index is created either during program startup or when the help browser is first launched, changing any of the help browser configuration options normally requires a restart of Purr Data to take effect. Compared to vanilla Pd, Pd-l2ork and Purr Data provide a comprehensive set of new and improved features, way too many to even just mention them all, so we refer the interested reader to the PdCon 2016 paper for details. The paper also covers the history and motivation of the Pd-l2ork project. One of Pd-l2ork’s major advancements over vanilla Pd is its infinite undo capability, which makes it easy to revert accidental changes without having to worry about taking snapshots of patches while they’re under development. Many of the other new features are simply GUI and usability improvements which, if done right, quickly become second nature to the user, so that they aren’t even consciously noticed any more, such as the graphical improvements and the ability to resize the IEM GUI elements and “graph on parent” areas using the mouse. A helpful change also worth mentioning here is the improved tidy up option in the Edit menu, which first aligns objects and then spaces them equidistantly. If you select exactly two objects A and B, say, and then connect one of the outlets from A to one of the inlets of B, then starting from the initial outlet-inlet pair the remaining outlets of A will be connected to the corresponding inlets of B. If you select two (or more) objects B and C, say, and then connect an outlet of a third, unselected object A to an inlet of B, then the corresponding connection from A to C will be done automatically. Conversely, you can also connect an outlet of B to an inlet of A to have the corresponding C-A connection completed for you. Finally, pressing the shift key while doing connections will let you do multiple connections from the same outlet in one go. It is worth practicing these so that you can amaze your vanilla-running friends with the speed at which you can construct rather complicated patches using these shortcuts. As of version 2.1, Purr Data has a help patch for this incredibly useful facility, which I have also provided with this document in the intelligent-patching.pd patch for your amusement. In the comments, the patch also includes detailed explanations of all the different intelligent patching modes for your perusal, and you can find some subpatches with exercises in the margin of the main patch. Other features will be more useful for advanced users, like the reflection capabilities (see the pdinfo, canvasinfo, classinfo and objectinfo help patches) and the new SVG elements for data structure visualizations. The latter have been considerably enhanced in Purr Data, see the “Pd-L2Ork Data Structures” section in the help browser. They also make it possible to create your own custom GUI elements in plain Pd, without having to learn a “real” programming language. As of version 2.5, Purr Data includes the latest version of Claude Heiland-Allen’s excellent Pd-Lua extension for embedding the Lua scripting language in Pd. This provides you with an easy means (much easier than Pd’s native C interface) to write your own custom Pd objects if they require the use of a real programming language offering loops, functions and complicated data structures. Lua is perfectly suited for this purpose, because it is light-weight and easily embeddable by design. It is also small and easy to learn, yet very capable, offering a complete range of imperative, object-oriented and functional programming language elements. Like Pd, Lua is an interpreted language featuring dynamic typing, which makes interfacing between Pd and Lua quite easy. Pd-Lua requires Lua 5.2 or 5.3, which should be readily available in all Linux distributions (on Mac and Windows the requisite Lua 5.3 library is included in the installer). A fairly extensive collection of examples to get you started can be found in the extra/pdlua/examples folder. We conclude this introduction with a little grab bag of helpful tips and tricks. If your questions aren’t answered here, please post them to the DISIS Pd-l2ork mailing list. On Linux there are some situations where you may want to run both classic Pd-l2ork and Purr Data on the same system. This may be useful, e.g., if you need some feature of Pd-l2ork like its K12 mode which hasn’t been ported to Purr Data yet. In order to do this, you need one of the JGU packages of Purr Data (see Where to Get It above). These will install into a separate directory (normally /opt/purr-data) so that the pathnames of the binaries and libraries in the package do not clash with those from a classic Pd-l2ork installation under /usr. The desktop icons will be named differently as well, and a symbolic link named purr-data will be created in the /usr/bin directory. The link points to /opt/purr-data/bin/pd-l2ork and lets you run Purr Data from the command line without having to specify the full path to the executable. Last but not least, the JGU packages have also been patched up so that they use a separate .purr-data configuration directory in your home directory instead of Pd-l2ork’s .pd-l2ork folder, so that the two programs can happily coexist. For singleton externals it will usually be enough if you just copy them into one of these folders and then relaunch Purr Data. External libraries containing a collection of different externals, on the other hand, will typically require that you also load the library at startup, using the available startup configuration options in the preferences (see GUI and Startup Options above). It happens to the best of us that we mess up our Pd configuration so badly that it is beyond repair. In such a case you probably want to go back to Purr Data’s default setup and start from a clean slate again. Unfortunately, Purr Data’s preferences dialog does not provide a button for this (yet), but there are ways to accomplish this. They depend on the particular platform, however. On Linux, do rm -rf ~/.pd-l2ork in the terminal (rm -rf ~/.purr-data when using the JGU packages). On the Mac, do rm ~/Library/Preferences/org.puredata.pd-l2ork.plist in the terminal. On Windows, launch the regedit program and look for the registry key HKEY_CURRENT_USER\Software\Purr-Data or HKEY_LOCAL_MACHINE\Software\Purr-Data. Delete that key and all its subkeys. Then just relaunch Purr Data. Your preferences should now be in pristine state again, and all the default search paths and startup libraries will be restored. Of course, you will then have to reconfigure your audio and MIDI devices as needed. This irritating behavior is due to how Pd handles the startup flags, especially flags which may override some behavior in other configuration options. The easiest way to get rid of all these mishaps is to remove the relevant options in the startup flags (when in doubt, just delete them all so that the startup flags field is completely empty) and save your options by clicking Ok in the preferences dialog. As far as I can tell, this was only reported on macOS so far. The symptom is that the GUI launches, but then hangs during the startup sequence after printing the message incoming connection to GUI in the console window. The GUI then becomes totally unresponsive, eating up 100% cpu, and the only way to get rid of it is killing it (“force quit”). The exact causes are unknown right now, but it seems that this behavior may be caused by bad 3rd party externals causing the realtime engine to hang or crash during startup. The GUI then waits for the incoming connection from the engine which never gets established, which makes it hang in turn. As it’s impossible to launch the GUI and remove the offending external in the preferences dialog in this rather unfortunate situation, the only known solution to this problem is to reset the configuration (see Resetting the preferences above), after which Purr Data hopefully launches without any hitches again. If you’re feeling adventurous, you may then start adding your local externals one by one until the GUI hangs again, at which point you will have identified the culprit, so that you can remove it from your system. Again, this seems to be a Mac-specific issue. Older (pre-2.0) Mac versions of Purr Data had the defect that old search paths and startup libraries from previous installations would keep piling up in the configuration until eventually Purr Data’s startup would become very slow. This has been fixed in the 2.0 version (and startup time on the Mac has generally been improved as well), but if you’re still using an old configuration from the pre-2.0 days, then you might still see remnants of this issue even in the 2.0 version. In most cases these should be harmless, but they may indicate a missing piece of GUI functionality due to Tcl code which has not been ported to Purr Data’s new nw.js GUI yet. In any case, feel free to report such messages at Purr Data’s issue tracker, so that hopefully someone from the development team can look into them. A proper bug report should at least include the message itself and the Pd object it relates to. If some special steps are needed to reproduce the message, you should report these as well. Also, please do make sure first that the specific message you’re seeing has not been reported in the issue tracker already.